All transactions are safe and secure with a reliable history in online purchasing behind each of our associates. 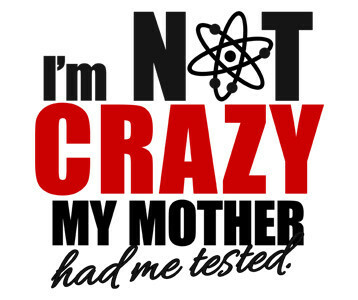 Buy the I'm Not Crazy My Mother Had Me Tested t-shirt to own Big Bang Theory clothing and merchandise. For Sheldon Cooper (Jim Parsons), being a theoretical physicist of extreme intelligence can sometimes lead to others thinking that he is crazy, including his friends Leonard Hofstadter (Johnny Galecki), Howard Wolowitz (Simon Helberg), Rajesh Koothrappali (Kunal Nayyar) and Penny (Kaley Cuoco). This The Big Bang Theory t-shirt displays Sheldon's response, "I'm not crazy, my mother had me tested." The shirt is a fan favorite, letting everyone know that like Sheldon, you're own quirky qualities do not make you insane, just unique. In addition to the I'm Not Crazy My Mother Had Me Tested tee above, browse the Big Bang Theory Clothing Gallery for more apparel like men's and women's clothes, kids shirts or hoodies.